The Big Red Piano Shop, aka. California Piano Supply Co., was once located at 2251 Venice Blvd. (the corner of Venice and Oxford Street), near Western Avenue. A chiropractor named Dr. Ashley Manning first opened the California Piano Supply Co. in 1927. Because the neighborhood wasn’t an ideal location for a piano store, he relied on gimmicks to lure customers to his location. However, one of his attention grabbing ploys backfired in 1929, when he was arrested and sentenced to 30 days in jail after neighbors filed charges against him for playing his radio over loudspeakers at random times during the day and night. The sentence was suspended after he agreed to stop disturbing the peace. 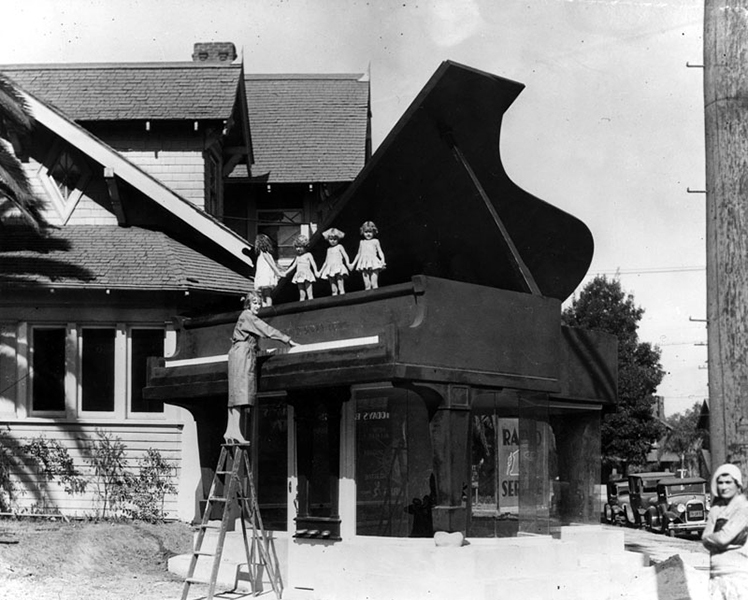 Around 1930, Manning added a large piano, measuring 40 feet high and 25 feet long, to the front of his store. Visitors had to walk under it to enter his showroom. The giant red piano received national attention, and became one of Los Angeles’s most recognizable icons of the 20th century. 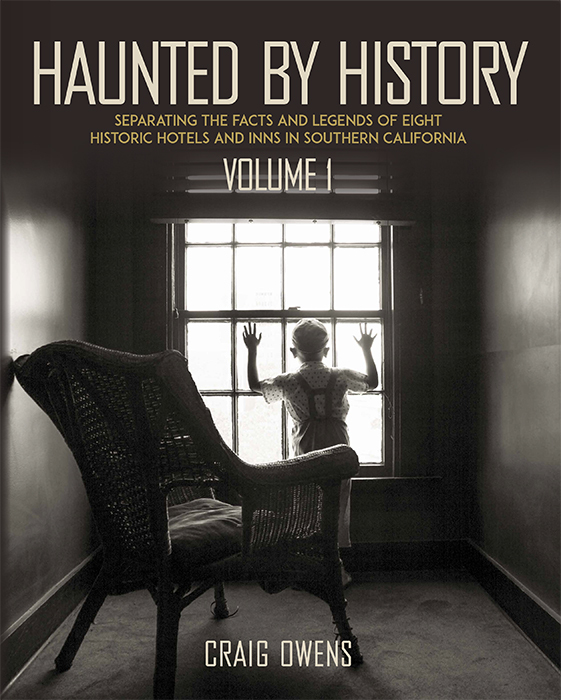 Ripley’s advertised it, and the New Yorker magazine once described it as “evidence of Southern California’s special brand of madness.” But Manning didn’t rely solely on his red piano to lure customers. He continued to host remote radio broadcasts, concerts, and free piano lessons for customers. 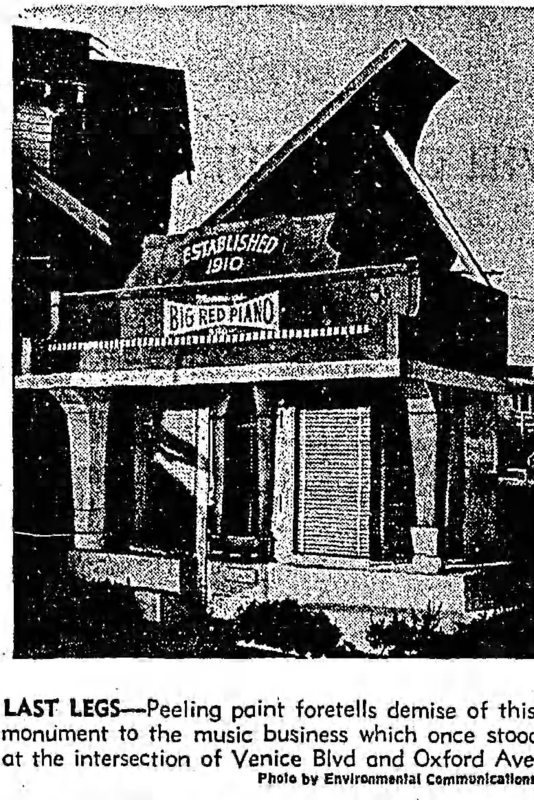 By the late 1930s, Manning’s California Piano Supply Co. became the Big Red Piano Shop. Decades later, it became Manning’s Big Red Piano Shop. 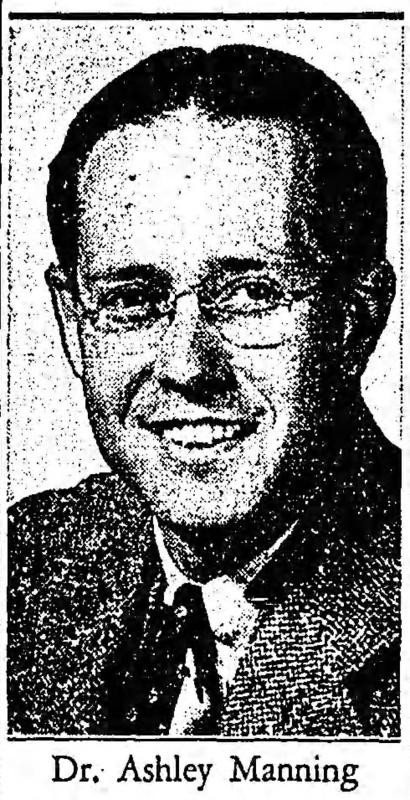 Manning also began to market his business as being originally established in 1910, a claim that isn’t substantiated by newspapers and city directories. 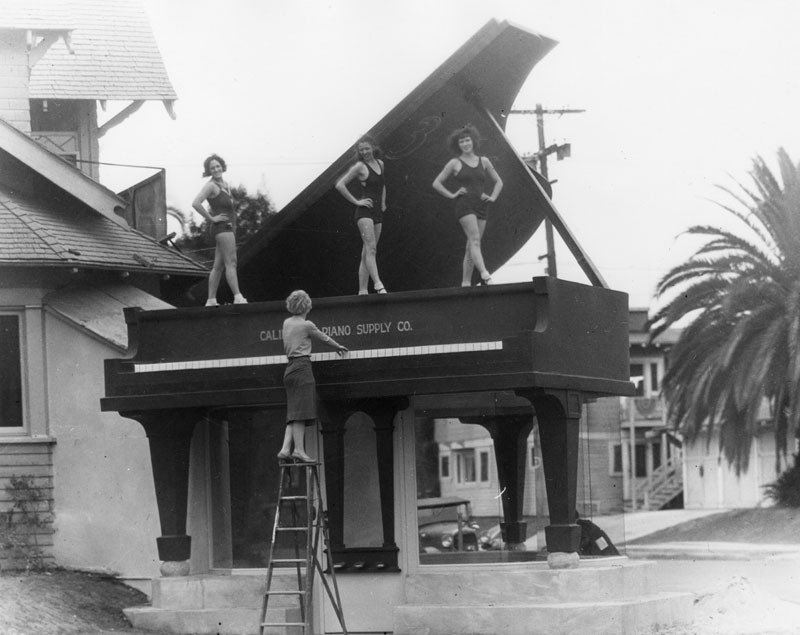 The Big Red Piano, circa 1930-31. Inscribed under the piano’s lid is a marketing slogan “3 miles from Higher Prices.” It meant that the shop was approximately three miles from downtown Los Angeles, Hollywood, and Beverly Hills. In 1966, Manning sold his business to another music company, who continued to operate it as Manning’s Big Red Piano Shop for four more years. The Refrigeration Equipment Co. then bought the property in 1970 and merged several buildings together to form a 150 foot showroom for its appliances. In 1972, a fire broke out in an adjacent wood-framed building that Manning once used as a repair shop, warehouse and office. Although the piano survived the fire, the Los Angeles Building and Safety Department declared that it had to be knocked down. In 1973, property owner Robert Taylor (not the movie star), tried to donate the piano to a historic and preservation organization, providing that the organization move the piano to a safe location. No organization accepted his offer. The Big Red Piano on its last legs in 1973. Photo: Los Angeles Times. 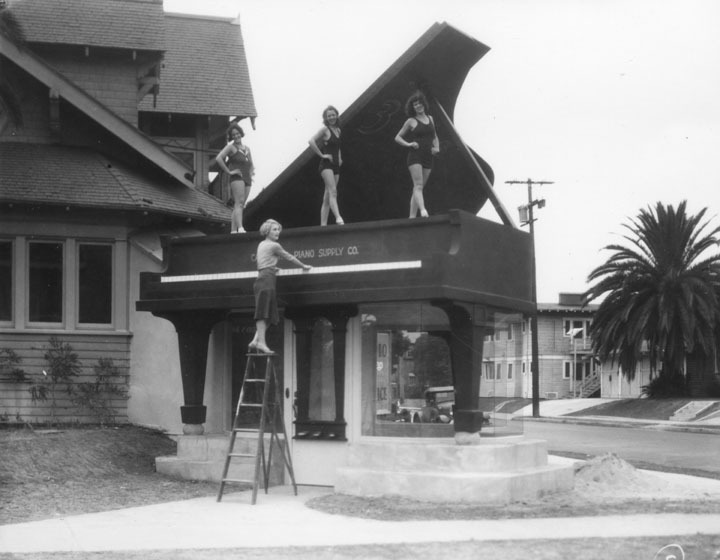 Eventually, a pop-architectural buff named Tom Sewell arranged for the piano to be moved 12 miles west to Venice, CA. The move was successful. However, when the contractor tried lowering the unsupported three-legged piano onto a new, specially-fitted concrete base, the piano broke into fragments and was lost. Pity there’s no big red piano to match with all our big and preferably red objects that somehow always manages to fascinate anyone at any point of time in our collection. I own an Ashley Manning piano. I wonder if it’s worth anything. Was Dr. Manning just a piano repair shop or was he also a builder? I worked for the company that bought The Big Red Piano shop. Wallichs Music City that was a regional chain that had seven locations. Wallichs sold pianos, organs, records, sheet music. Magnavox TV’s, stereo,s among other music related things. I worked at the Wallichs warehouse in Torrance. I had to drive up to LA once a week to clean the Manning showroom, sweep and vacuum the floors and dust the pianos. My employer sold me the old Manning 1962 Ford Econoline Van. It had the Manning name and the Big Red Red Piano painted on the sides. That was my first real job. I was 18 years old and worked there for 2 1/2 years. I left there in 1972 when I was drafted into the US Army. I was making $2.05 an hour when I left.